Monday, October 8, 2012 ratings — It was a night of all originals. 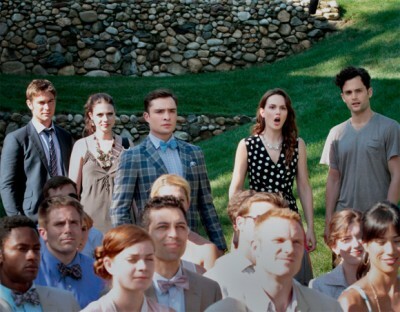 Gossip Girl returned for its final season and a new year of 90210 debuted as well. We also had original episodes of How I Met Your Mother, Partners, 2 Broke Girls, Mike & Molly, Hawaii Five-0, The Voice, Revolution, Dancing with the Stars, Castle, Bones, and The Mob Doctor. On NBC, The Voice was up slightly from last Monday’s installment with a 4.7 rating in the 18-49 demographic with 12.58 million total viewers. It won the night in both categories. Revolution followed with a 3.1 rating (-3% week-to-week) and 8.21 million. On CBS, we had the usual line-up. How I Met Your Mother attracted a 3.2 rating (-3%) and 8.14 million viewers. Struggling Partners grew a little with a 2.2 rating (+5%) and 6.34 million. At 9pm, it was 2 Broke Girls with a 3.7 rating (+6%) and 10.12 million. Mike & Molly followed with a 3.1 demo rating (+7%) and 9.42 million. Hawaii Five-0 ended the night with a 2.2 rating (+10% change) and 9.01 million. It was tied for second place in the demo and was in second in viewership. On ABC, Dancing with the Stars drew a 2.1 rating (0% change) and 13.33 million. Castle followed with a 2.2 rating (+16%) and 10.56 million. On FOX, Bones drew a 2.0 rating (-5%) and 7.09 million viewers. It was followed by struggling Mob Doctor with a 0.9 rating (-10%) and 3.46 million. And on The CW, two shows returned. The season premiere of 90210 brought a 0.5 rating in the demo with just under one million viewers. Year to year, the show was down by 44% in the demo (vs a 0.9 rating) and down by 38% in viewership (vs 1.61 million). That was followed by Gossip Girl with a 0.4 demo rating and 0.768 million. Year to year, the show was down by 43% in the demo (vs a 0.7 rating) and down by 44% in viewership (vs 1.37 million). What do you think? Are you surprised by the declines of the CW shows? What were you watching last night? I’m not surprised by CW’s decline, both of their shows are getting a little old. Shows like Castle and Revolution are this year’s must-sees. Bones is annoying anymore. Now that they have had the kid, the show has Jumped the Shark. I still love Revolution though it has gone a little to familyish. Castle is at a stage like Bones has been. Will it go stupid or will it work out for them? i have not seen Hawai’i 5-0 as I can’t tape 3 shows at a time. So I watch it On Demand and have not done so. But I still love the show.